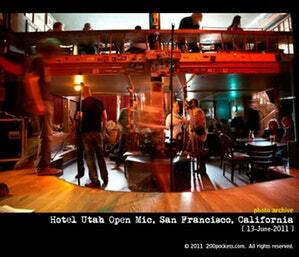 The Hotel Utah open mic is the epicenter of San Francisco’s singer-songwriter community. Its stage attracts performers at all stages of their careers: from seasoned veterans to first-timers. It attracts music fans who know a good thing when they see it. The musicians who come regularly don’t come just to get a little “stage time” – they come because of the community that calls Monday at The Utah home – and the musicians that come in for the first time eventually start to come regularly. So come on down this monday, have a beer, bring your guitar if that’s your thing, and sit back and enjoy.